I have a totally cool holo to share with you today from Ninja Polish. This is one of the polishes I received in Vegas from Rhonni the owner herself during Cosmoprof. She asked bloggers to pick out a color from her Infinity Gems collection. The polish Reality stood out to me the most because it is a yellow holo! 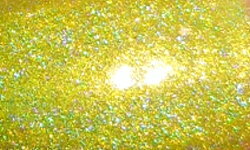 I do not own a yellow holo and it is not something I really recall seeing much in nail polish. Reality is a yellow holographic. Color: This isn't gold and this isn't green. This is yellow and a yellow holo at that! I didn't think these really could exist. This does have the slightest, and I mean slightest touch of green to it, but this most definitely reads yellow! This color is amazing! Formula: Yellow in general is a difficult color in nail polish when it comes to formula. Yellow holo, I wasn't sure what to expect. This formula is excellent though, and I'm very impressed. This applied opaquely, smoothly, and easily. I only needed 2 coats. Price: This is $10.00 on the Ninja Polish website. You can also purchase the entire set Infinity Gems polishes for $70.00. Overall: This is a definite must have polish for me. I'm so impressed and thrilled by so many aspects of this polish from color to formula. I love the yellow. I love that it's holo. I have so much love for this polish, and it definitely will be a Top 25 of 2015 contender!